Saudi fighter jets bombarded the Yemeni capital city of Sana’a with banned chemical weapons early on Monday, leaving dozens of people dead and injured. According to reports, the Saudi warplanes used prohibited bombs and missiles in their Monday’s airstrikes on Sana’a and claimed the lives of scores of civilians. Elsewhere in Yemen, at least 17 civilians were killed and dozens of others sustained serious injuries after the monarchy’s airstrikes hit Yemen’s Ta’izz. Additionally, the kingdom’s air raids pounded the city of al-Hazm in Jawf province and killed 18 people. 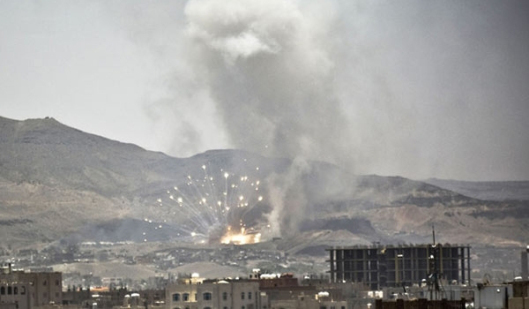 The Saudi airstrikes continue as the representatives of Yemen’s Ansarullah movement have headed for the Swiss city of Geneva to attend the UN-brokered peace talks aimed at ending the Saudi aggression against the Arab country. July 7, 2015 in Uncategorized.